The Alpha jet is an Advanced jet trainer/light attack aircraft. 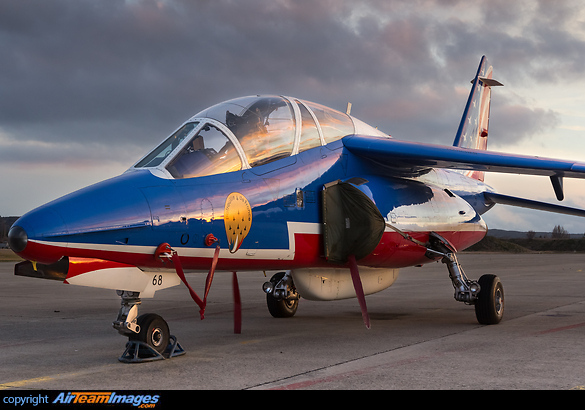 It came from a joint Franco-German programme in the 1970s, and is still in service in a number of countries, mostly as a trainer. It is also used by some aerobatics teams. 2 x Snecma Larzac (2976 - 3176 lbf) turbofan engines. German Alpha jets and some attack versions had more powerful Larzacs, rated at 3175lb thrust. French and German versions could both carry ventrally mounted cannon pods for weapons training, but the attack version could also carry up to 5500lb of stores on four underwing pylons.